Durban, 1992: “A historic moment in word cricket! Umpire Cyril Mitchley is not sure and indicating to the third umpire sitting in the room with a television monitor - all for the first time,” said the commentator, when South African debutant Jonty Rhodes made a run-out attempt in the first Test match of India’s tour of South Africa. For the first time in world cricket, an intervention by the third umpire using television replays was being used and it confirmed the dismissal of none other than Sachin Tendulkar. It was also the first time that technology influenced an umpire’s decision and the final verdict fell into the hands of a “third” umpire. Since then, the use of technology has transformed the game for players and viewers alike; the question is, has cricket really benefited from such drastic changes, or is the sport losing its essence with the advent of these new methods? The 21st century has witnessed the rise of the Decision Review System (DRS) which grants players the right to challenge an on-field umpire’s decision for dubious caught-behind and LBW appeals. DRS mainly comprises of three technologies: Snickometer, Hot Spot and Hawk Eye, which are used either in conjunction or independently for different situations. The Snickometer, invented by English computer scientist Allan Plaskett in the mid-1990s, is a micro-voice based technology in which the variation in magnitude of sound waves helps the umpire to find out if the ball touched the bat on its way through to the wicket keeper. Hot Spot is an infrared imaging system used to determine whether the ball has struck the batsman, bat or pad. Any suspected nick or bat/pad event can be verified by examining the infrared image captured by cameras, which usually shows a bright spot where contact friction from the ball elevates the local temperature. Hawk Eye is a technology that visually tracks the trajectory of the ball and displays a record of its statistically most likely path. Developed by Dr. Paul Hawkins from the UK, Hawk Eye was extensively used in Tennis, Rugby, Badminton and Volleyball before its full-fledged foray into cricket. It is currently the most important part of LBW decision-making as it helps to determine whether the ball pitched in line with the stumps, where its point of impact with the batsman’s leg was, and its projected path towards the stumps. Given the fact that umpires in cricket have always held the position of being guardians of the game, and also given that one of the basic values a cricketer learns is respecting their decision at all levels, DRS initially faced criticism from purists who felt that questioning the umpires’ judgement was a violation of the spirit of the elite sport. However, the importance of achieving accurate decisions gained increasing prominence over time when the occasional “human errors” made by umpires affected the outcomes of crucial matches. Ultimately, there was a general consensus that the use of any form of technology which increases the probability of arriving at a correct decision should be encouraged and that DRS should be looked at as a helping hand for the umpires, instead of being perceived as a tool which diminishes their authority. While DRS still faces its share of controversies, there have been several other technologies which have aided umpires in recent years. Stump Microphones are extremely useful for umpires to detect fine nicks in case of keeper catches, especially when such edges would have been inaudible in the face of massive crowds in attendance. LED bails, whose introduction was perceived by most as a measure to increase the game’s aesthetic value, have a far more important role to play as they prevent the loss of the crucial split-second when the bails are first dislodged by the ball and have resulted in more successful run-outs and stumpings being affected. For rain-curtailed matches, the Duckworth-Lewis-Stern (DLS) Method serves the purpose of readjusting the target score based on a mathematical calculation which weighs wickets lost and overs remaining in the innings. Cricket being a sport which has such a complicated set of rules, the influx of technology has undoubtedly helped the game achieve a higher level of precision in decision-making. The growth of technology has also resulted in the evolution of the fans’ experience of watching a match. DRS and its components make the television broadcast more interactive not only in case of a referral, but also when they are used to interpret routine passages of play. The emergence of multiple camera angles has enabled the viewers to enjoy a stadium-like experience from the comfort of their homes. 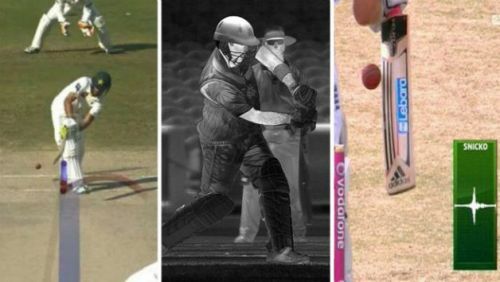 Since the times when there used to be limited cameras at only one end of the field, cricket matches have evolved, and are now covered through a wide range of cameras across the ground, along with fan favorites like Stump Cam, Spider Cam and Umpire Cam, which provide different perspectives of the game to viewers. The use of Stump Mics and on-field Player Mics gives fans an opportunity to listen to players’ tactics and sometimes, even sledges during a live match. In IPL 2018, Star Sports made a remarkable move to enhance the experience for those watching from home by introducing “Virtual Reality” coverage where viewers could choose their preferred camera angles and even get a 360-degree view of the stadium. Cricket’s technological revolution has, however, also been accompanied by a rise in the number of player controversies relating to sledging and ball-tampering in the past two decades. This is not to suggest that such acts of on-field misbehavior did not exist before; just that players used to get away with them due to the absence of multiple cameras and stump microphones. Hence, improved coverage has also played an important role in safeguarding the reputation of the game. The advent and use of technology in cricket has definitely helped the game in its journey towards becoming a global sport, by facilitating accurate decisions and creating an unprecedented viewer experience; it has also aided the sport’s quest to retain its honor as the gentleman’s game. Cricket’s alliance with technology has indeed been a fruitful one so far and is all set to flourish even more in future.